Here's a closer view of David Shilling's installation. 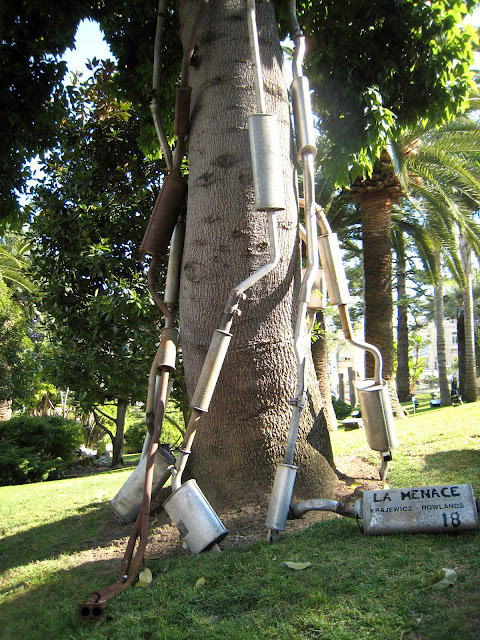 If you missed yesterday's post please click on THIS LINK to read about his work. This installation - one of 35 taking part in the exhibition - made me laugh. 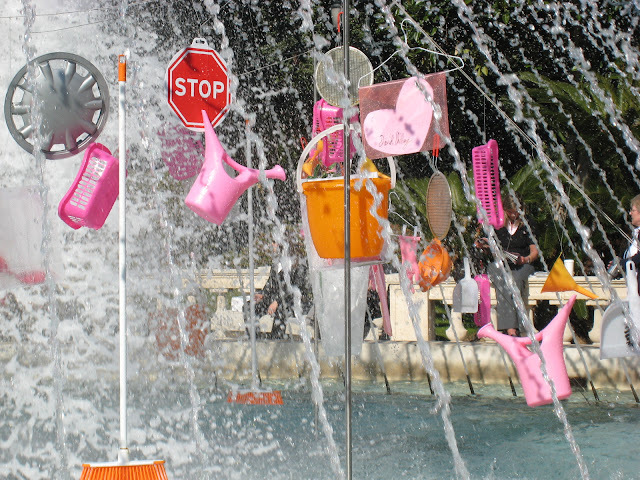 Somehow there's such a dichotomy between the luxury of Monaco and all these plastic items hanging in one of the beautiful fountains of the Casino Gardens. The lady on the left has just the right colour umbrella, doesn't she? 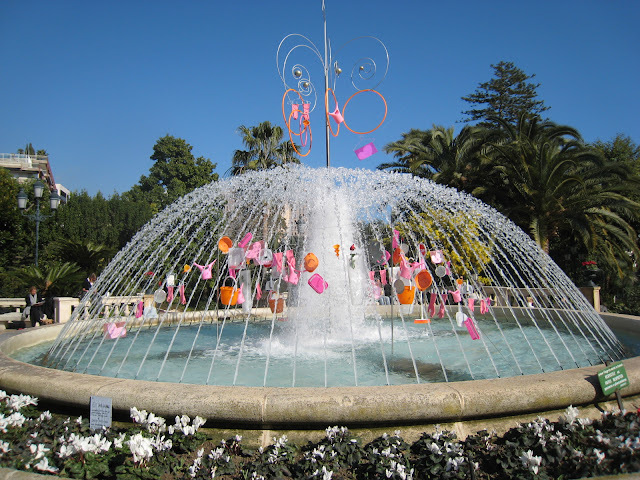 This fun installation uses one of the main fountains in the Casino Gardens. 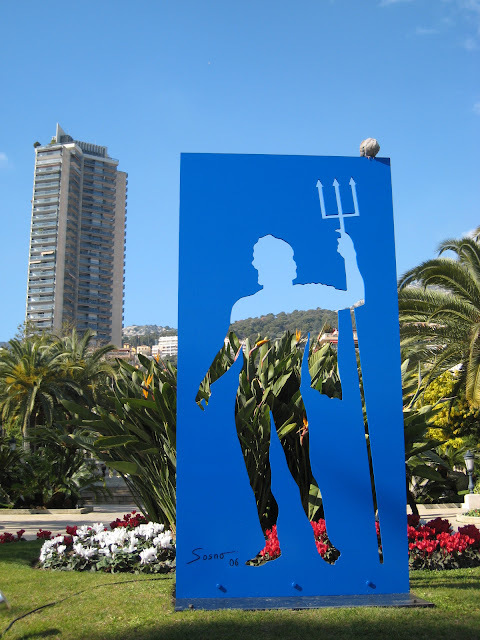 The artist, David Shilling, is an Englishman, living on le rocher of Monaco. He's worked in many mediums, in particular I remember him as a famous milliner in London. His mother, Gertrude Shilling, was a much-loved British institution, with the press naming her 'The Ascot Mascot' as she always appeared at the Ascot races wearing extraordinary hats designed by her son. 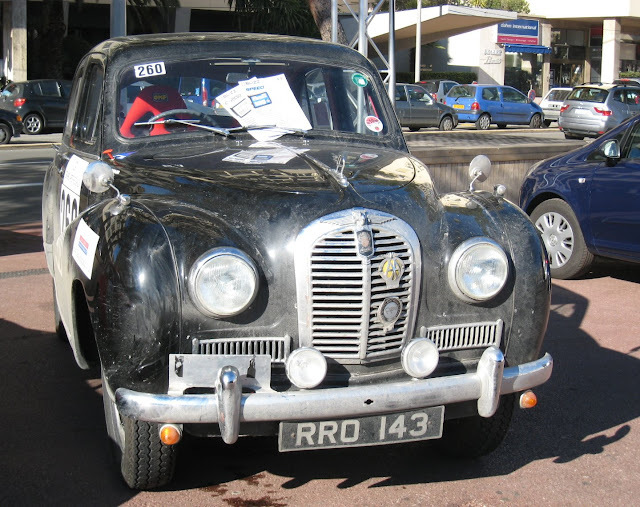 One year David's design outgrew his father's long wheel base Rolls Royce, and so the hat had to follow in a van. If you follow the link above, you can see some of the creations David made for his mother. 'Either we leave the world a little richer than when we arrive, or poorer. Understand that if we don't leave it richer, one day there will be no world left.' - David Shilling. 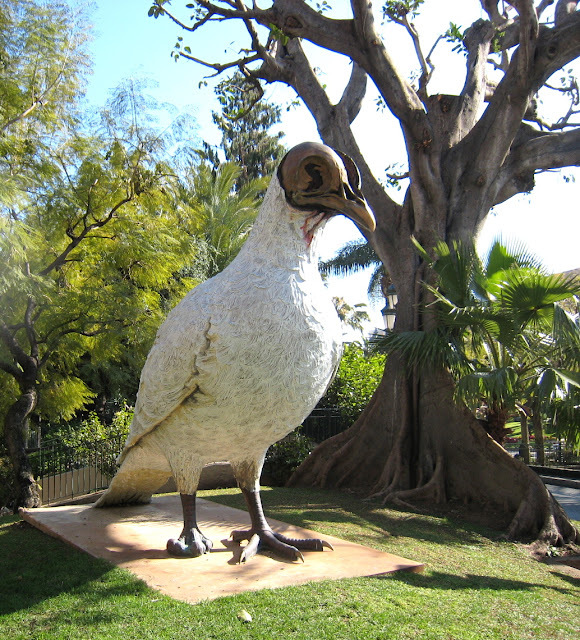 Tomorrow - a closer look at this installation. There's a fascinating exhibition of art on at the moment in the Casino Gardens and I was photographing many of the exhibits for a series that starts tomorrow - do come back, it's on Art and the Environment. Anyway, I was photographing near to these two gentleman when the one on the right called out to me, 'Copyright for me if you take our photo,' and laughed. 'Right then, I'll take your photo,' I said. 'Smile!' And they did. 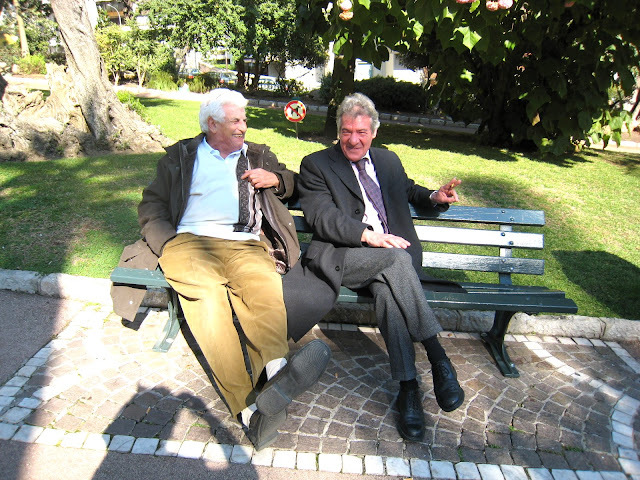 I then asked if they lived in Monaco and the same guy told me, 'Yes, we live in these gardens.' I don't think so! Later I saw them walking around the Metropole Shopping Centre. 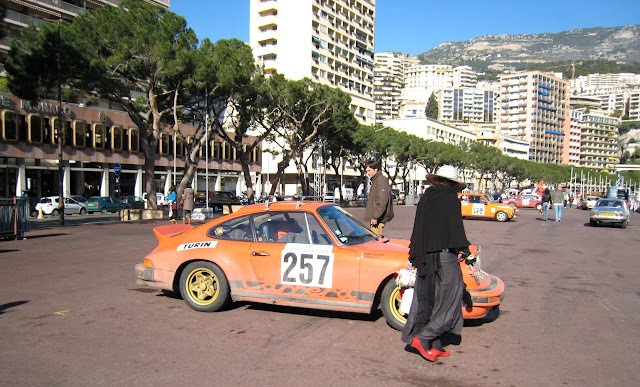 Here we are - as per the request for 'Monte Carlo Gentlemen' - I think you'll agree this first one properly fits the bill: tall, slim, good-looking (trust me) well-dressed, designer stubble, sunglasses - bien sûr - and car keys, presumably for something smart parked in the car park nearby. 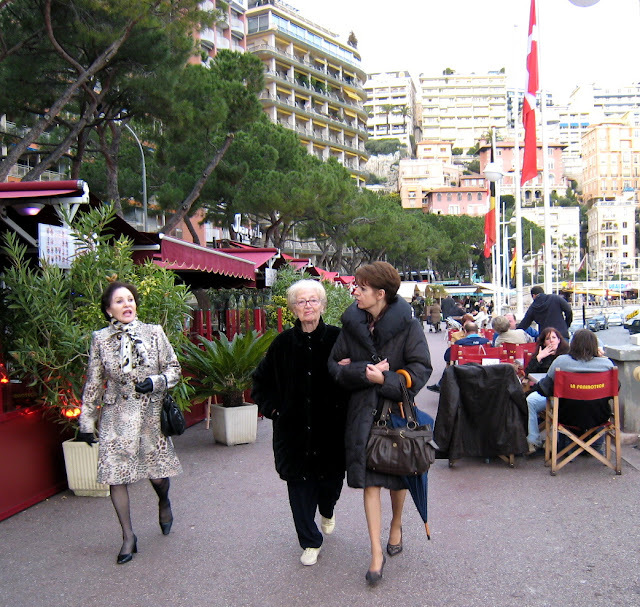 Three ladies walking along the port - the yachts are to the right of the photograph. 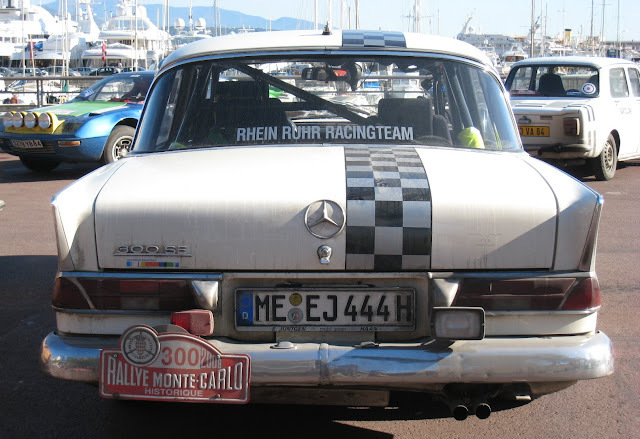 I've had a suggestion, by the way, for 'Monte Carlo Men.' Good idea! Watch this space. 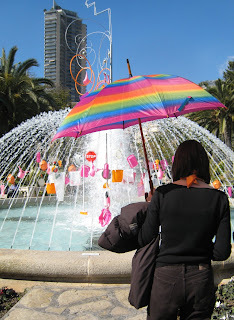 Colours - in the pedestrian street just up from Port Hercule. Looks like everyone has gone away for the winter? When I see a photo like this I realise I need a bigger camera with a better zoom - but anyway, it gives you an idea. 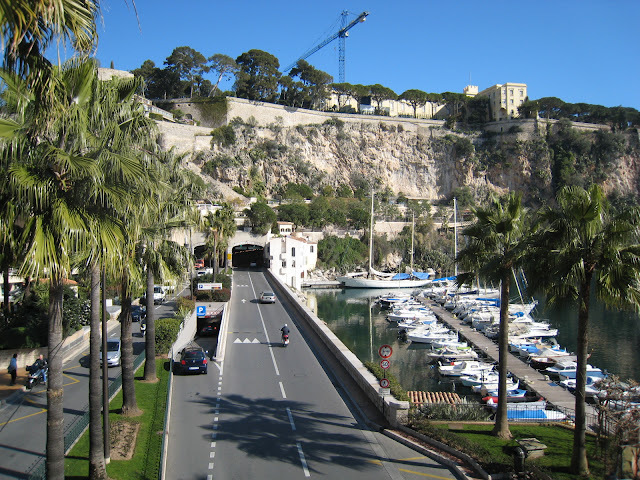 The majority of streets in Monaco slope - hardly surprising when the Principality is built on hills. 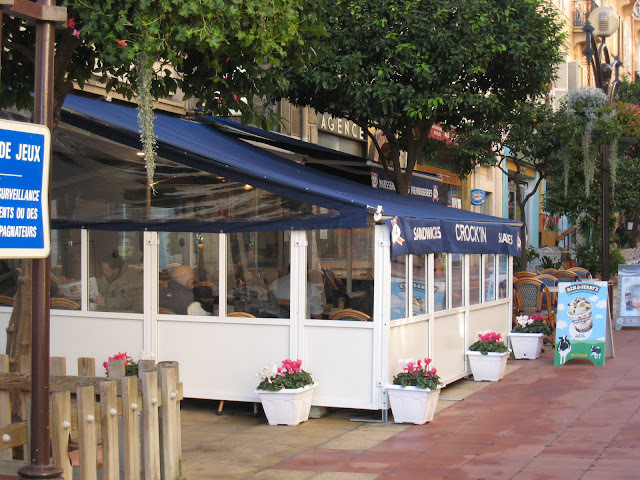 This restaurant is the pedestrian street (rue Princesse Caroline) that runs from Port Hercule to rue Grimaldi. As you can see it appears to be having a deck built, presumably so it can accommodate tables and chairs. 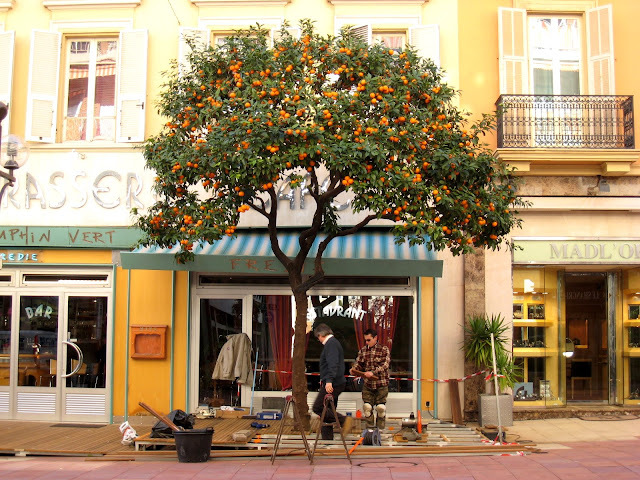 Note the orange tree. You'd not lack for fresh orange juice at the moment. 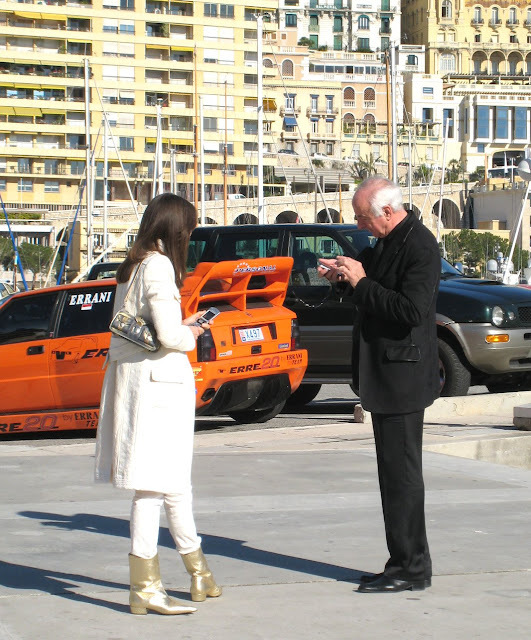 Valentine's Day in Monte Carlo? We'll have champagne - perhaps Veuve Cliquot? 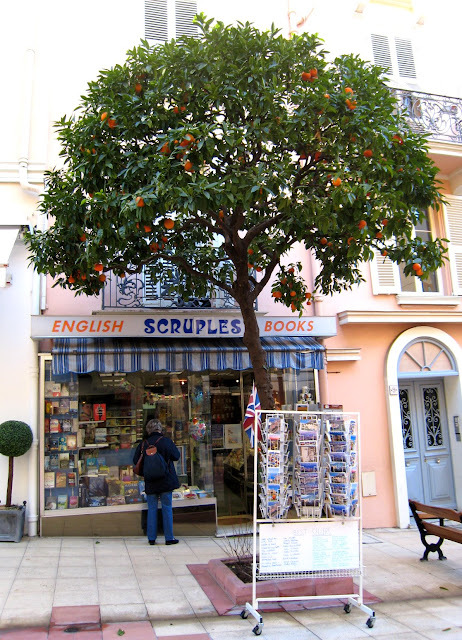 This little shop is in one of the tiny streets that runs from the Port to rue Grimaldi. 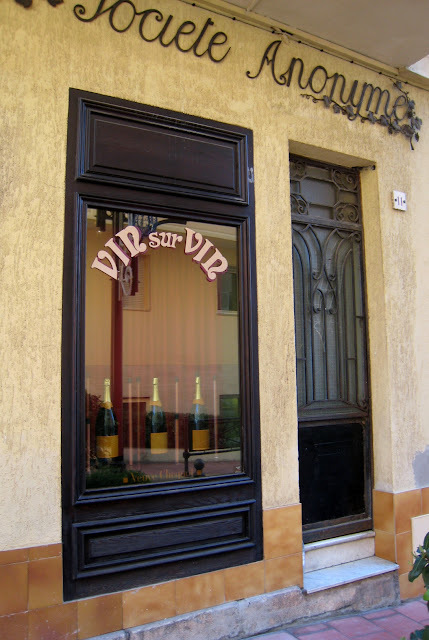 Veuve Cliquot is a champagne house in Rheims - veuve means widow. It was founded in 1772 by Philippe Cliquot-Muiron who played an important role in establishing champagne as the beverage of choice of European nobility and the bourgeoisie. A generation later, the son of the founder died, leaving his widow in control of the company. 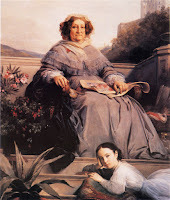 It is she, Madame Cliquot, who is credited with the industrialisation of champagne production. You see her portrait to the left. Happy Valentine's Day! Here's yesterday's lady. All alone now. Still with her cell phone and this time stuck to her ear. She's facing the yachts but not seeing them. I prefer this to yesterday's photograph although yesterday's, with woman and man both texting, told a strange story. 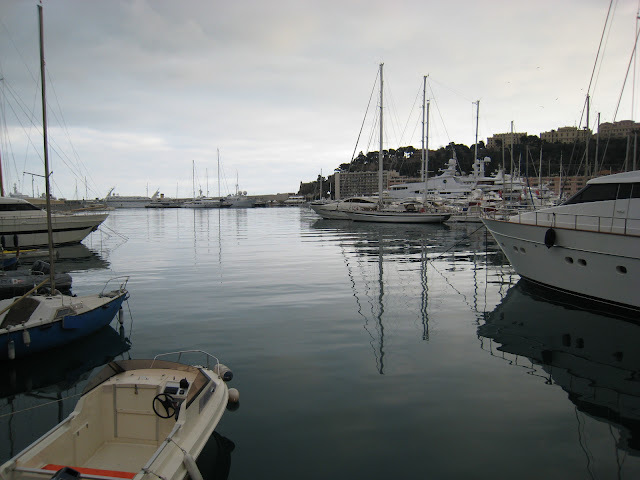 This is the area - port and yachts to our right - that was filled with cars until the day before I took these photographs. Now it's emptying fast. This lady walked around every car, examining each one very closely. 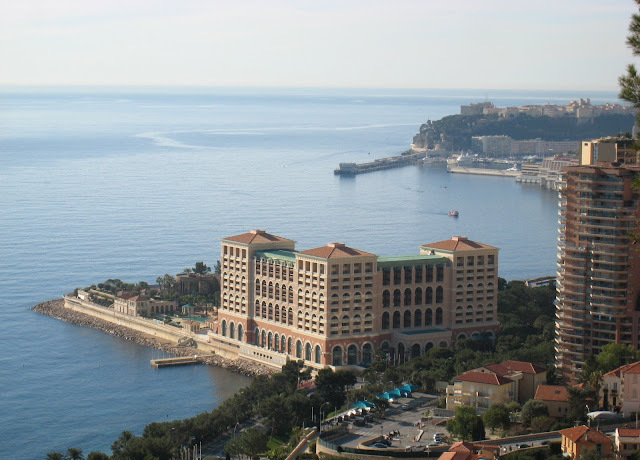 The Start/Finish line of the Monaco Grand Prix is on the road you see on the left. Another dirty car for the petrol heads. This one is from the UK, isn't it, Gail's Man? 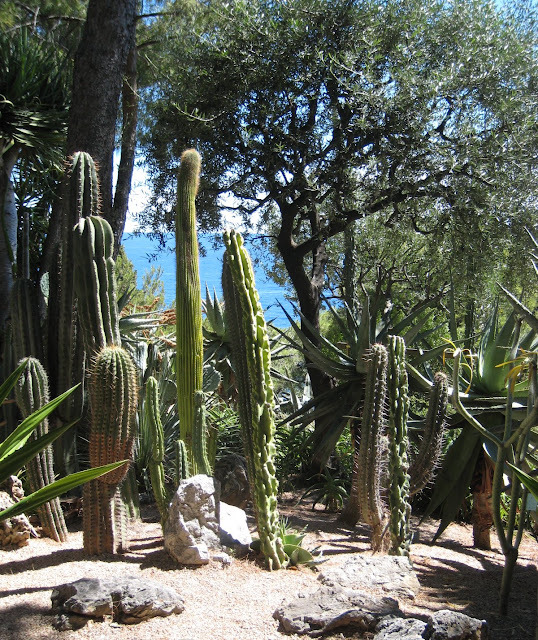 This is a section of the beautiful Jardin St. Martin on Le Rocher displays cactus. 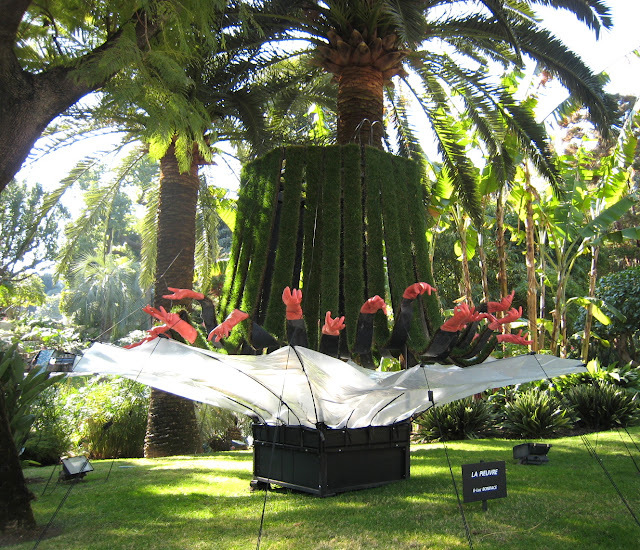 Another of the many gardens of Monaco, Le Jardin Exotique, has nothing but cactus and succulents and we'll visit that soon. 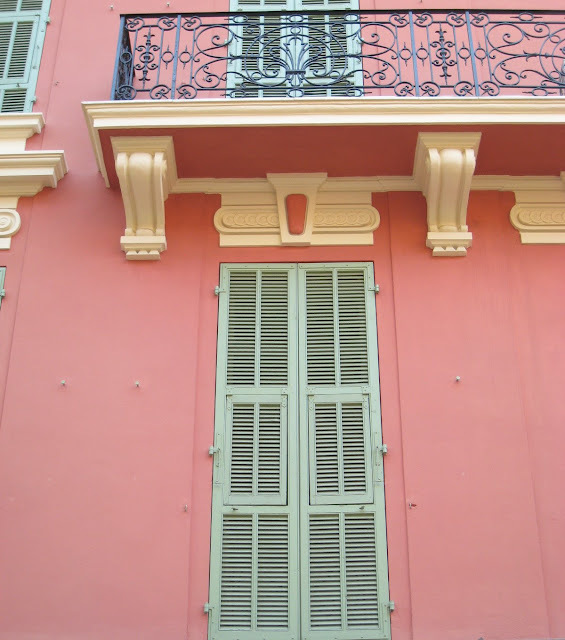 Menton Daily Photo and Monte Carlo Daily Photo - FIRST BIRTHDAY! And of course, a massive thankyou to Eric of Paris Daily Photo, whose brilliant vision this was and to Demosthenes and Igor, who put in endless time working on the technical issues in keeping us all up and running. 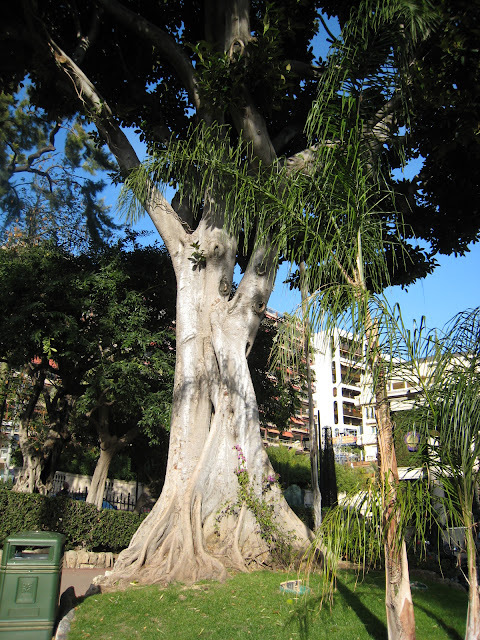 Such a beautiful trunk on this tree in Casino gardens. I think it's a magnolia. A young climber, perhaps a bougainvillea, grows against it. Note the smart rubbish bins in Monte Carlo. This bronze of St. Devote stands in front of the church which you can see if you click on the link. According to legend, on the 27th January 312, a ship bound from Corsica, bearing the lifeless body of a young Christian martyr, ran aground here. 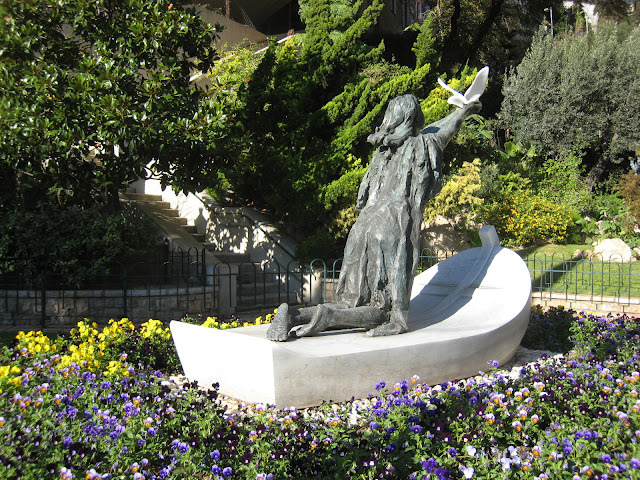 It was discovered by some fishermen and the young martyr delcared the patron saint of Monaco. "So...you've forgot what happened on the night of St. Devote, eh? I can't see HOW. It wasn't just the royal family-- Prince Rainier and Prince Albert and Stephanie and Caroline and all their chirren--we almost went up in flames too! If you remember, there was an enormous bonfire pile of palm fronds--with a wooden dory on top of them. There were about a half dozen Pompiers--every single one of them smoking--nonchalantly standing around with huge jerrycans of gasoline. 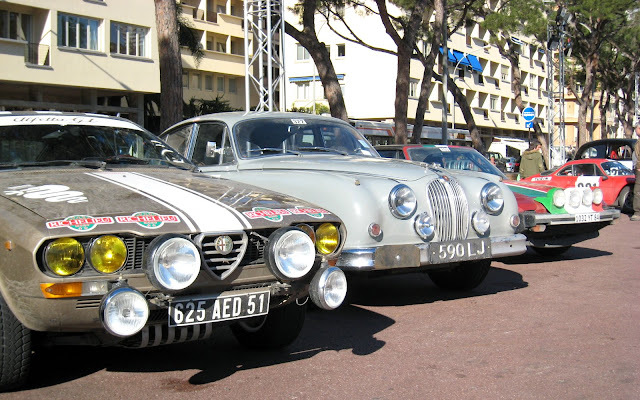 The combination of Gitanes and gasoline alone gave me some pause...but nevermind...it looked very French. You and I were waiting next to the bonfire area--we'd decided to stand on the quai and see the fireworks. It turned out to be a perfect spot, because we were right next to the damn thing--which is where the Royal lighting-of-the-beacon was about to occur. As the Rainier entourage approached--the pompiers began sloshing away, emptying an alarming amount of gasoline on the pile. But I figured, hey-- there were a lot of fronds, and they'd probably need a good boost to get going. I also assumed that some designated fireman-flunky would do the actual lighting. I was so wrong. As I recall, almost all the adult members of the Royal family were handed some sort of burning torch (the pompiers were apparently lighting anything they could get their hands on). Now, remember, the Royals hadn't seen the gallons of gasoline that had just been glugged all over the fronds. They innocently stepped forward and put their torches on the pile and FWOOOOMPH!! There was a fireball that could be seen from outer space. I thought my face had melted. Whichever Princesse it was who was wearing the full length mink--jumped back and started patting her coat frantically, so as to put out any stray embers. I have this vision (seared, as it were, into my brain) of Prince Rainier and Prince Albert completely outlined in a corona of flame. Everybody was sort of stunned for a moment--the flash had been like one of those cartoon explosions--there was total silence (except for the crackling fire). Then bits of ash began to float gaily around us like black snowflakes, and everybody started to laugh. 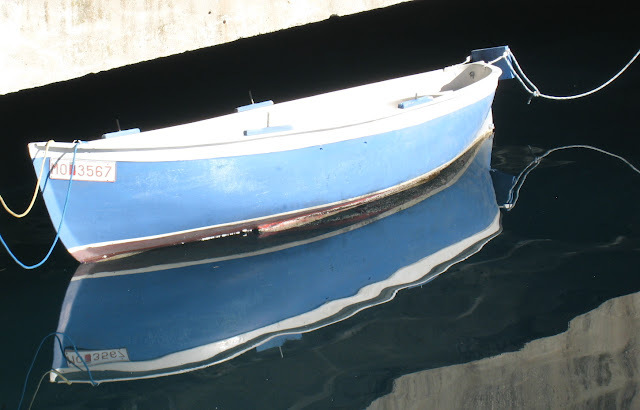 The fireworks went off with a bang, too, but they weren't near as dramatic as the lighting of the dory! Now do you remember?" Now, of course I do. After, we sat on the port, feet dangling over the edge and watched the fireworks and listened to the accompanying music. A dull day at the port but the light is somehow rather peaceful and romantic - the sea was so still. How spoiled - and lucky - we are here when a dull day is of note! You don't have to be rich to eat in Monaco. This little place, overlooking the port serves sandwiches and snacks. Once winter is over, the protective covering will be removed. 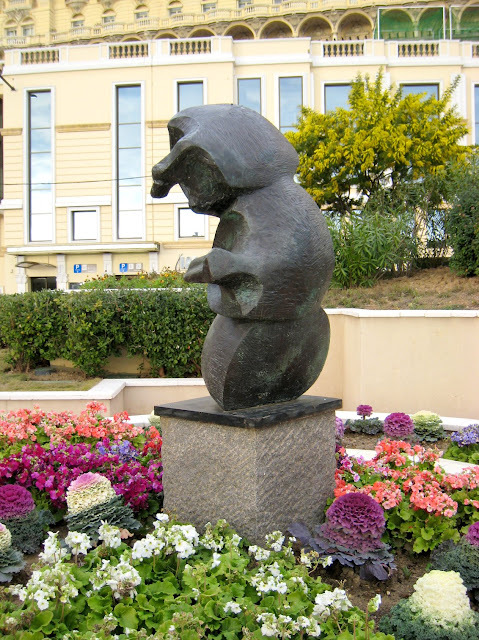 This sculpture by the celebrated sculptor, Henry Moore, stands in a small garden alongside the steep road that goes up from the port to the casino. Note the ornamental cabbages and the mimosa in bloom. 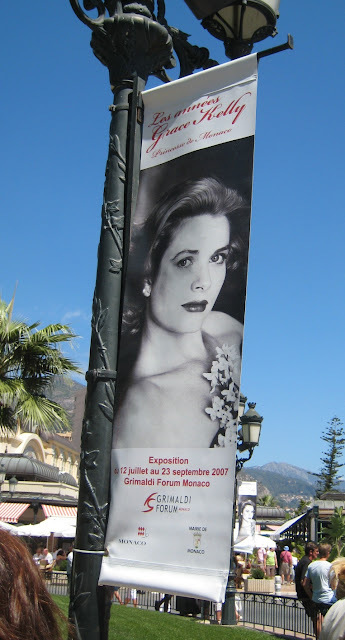 There are so many iconic images of Monte Carlo: the port with its luxury yachts, the casino, the Hôtel de Paris and the Monaco Grand Prix but probably it was Princess Grace - the beautiful American actress, Grace Kelly, who married Monaco's Prince Rainier - who really put it on the map. Today is Theme Day with 136 participants from all over the world taking part. Do take time to visit them and see what other bloggers think is considered iconic about their cities.